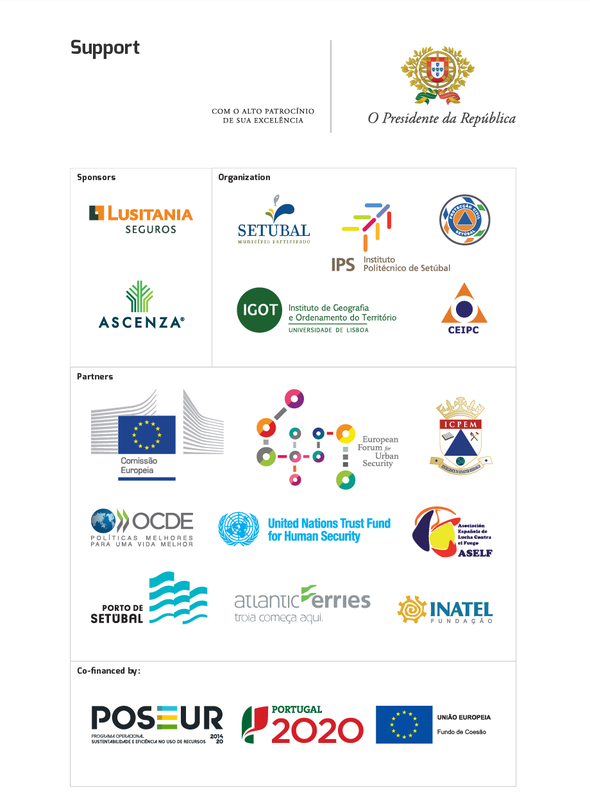 The second International Conference Risks, Security and Citizenship was held in the city of Setúbal, Portugal, on March 28-29, 2019, with the theme "Risk Management and Climate Change". With the joint organization of the Municipality of Setúbal, the Center for Studies and Intervention in Civil Protection, the Institute of Geography and Spatial Planning of the University of Lisbon and Polytechnic Institute of Setúbal, and the High Sponsorship of His Excellency the President of the Portuguese Republic, the works developed in plenary sessions, thematic sessions and free communications sessions. As a result of the reflection on the proposed theme, the Conference adopts the following. The impact of climate change (CA) is increasingly a concern for States, particularly in the Mediterranean region, given the greater vulnerability to their effects, namely desertification, drought, forest fires, coastal erosion due to rising of sea level, the increase of storms, the spread of vector-borne diseases and air pollution, among other extreme events. As a consequence of the identified scenario, southern Europe is expected to show a growing tendency, as in other regions of the world with a similar climate, to be increasingly exposed to periods of prolonged drought, as well as to the occurrence of more frequent and intense extreme heat waves and other extreme events. The public policies of generally all States have incorporated the commitments made in the context of the United Nations Framework Convention on Climate Change and, more recently, under the Paris Agreement. Of the two aforementioned climate policy instruments, a common and decisive variable is highlighted - intersectorial cooperation. This means that the problem of CA should not be treated in isolation and independently, but in an articulated and consequent way. It constitutes now evidence that new CA risk communication mechanisms needs more investment, to be more participatory and capable of stimulating public involvement in coproducing mitigation and adaptation measures. The aim is also to create conditions for changing citizens' behavior. Understanding how CAs affect natural and human systems is one of the greatest challenges facing the scientific community today. To Increase knowledge about the impacts of CA requires not only the projection of future climatic conditions, but also the assessment of the magnitude, location, and temporal occurrence of hazardous processes with a climate forcing. It is on the basis of this knowledge and in the reduction or management of their uncertainties that the assessment of risks systems and vulnerabilities can be effective. It is also important to invest in preserving the environmental balance, as a critical factor in promoting the health of communities and consequently reducing the costs associated with providing care. The scientific community is responsible for producing information, knowledge and decision support tools that enable technical and policy makers to anticipate, prevent and minimize the impacts of CAs. Policy makers should approve effective risk management and protection measures for people and assets that result in the resilience of communities, public and private institutions, systems and society in general. 6.Design and characterize education and training content for CAs, supported by media, formal and informal, analog and digital. The Conference underlined the important role of citizens, civil society organizations, universities, polytechnics and economic agents, building more resilient societies, mobilizing everyone in a free, multidisciplinary and informed debate on the themes of Risks, Security and Citizenship, as an instrument of collective awareness of the challenges that CAs put in place. It was also expressed the need to institute instruments for regulating the use of natural resources by economic agents, as well as defining adequate social and economic counterparts measures to ensure them in favor of the communities and territories where they are inserted, given the systematic use of those resources. The Conference and the quality of the participants affirm the relevance of the city of Setúbal in the national and European context in the construction of the resilience, through a strategy of instrumental partnership of Local Democratic Power, with Civil Society, Universities and Polytechnics and the active engagement of the economic agents. This course of action is to be continued in the process of preparation of the 3rd edition of the conference that will be held on 25th and 26th March 2021! Setúbal, 29th of March 2019.